When Persona O.A. was initially released as a part news and game app, its news features were all in tact and its gameplay ones were mostly missing. Fast forward to now and its gameplay features are all in, with dungeons to crawl, its first dungeon event and Persona 5’s wonderful characters available to spend time with in brand new story events. As a game, Persona O.A. condenses the Persona 5 experience into one that is very quick and easy to open up if you have a spare minute on the go, albeit sacrificing some of its console game immersion in the process. 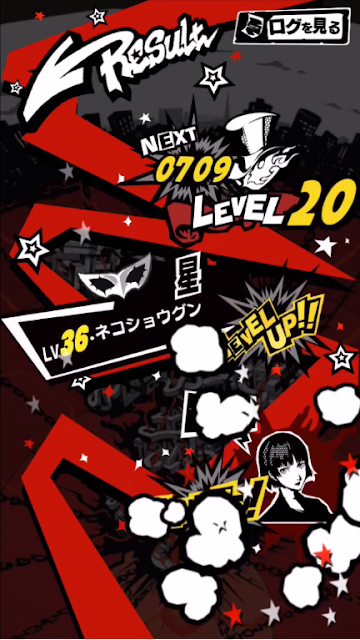 But if you prefer to have smartphone games that are easy to manage like I do, Persona O.A.’s condensed version of Persona 5’s relationship building and monster collecting may be worth your time if you can get past the language barrier. The main gameplay features in Persona O.A. do their best to recreate the general feel of Persona 5 but with less immersive features like the ones that are usually in console games. The focal point in O.A. is its search game based around Persona 5’s Mementos where you can choose a dungeon then fight and explore your way through it get treasure and Persona points. This fighting and exploration is mostly in theory though, as apart from choosing your fighting partner and Persona, the actual fighting and exploration is done automatically over time. Each dungeon takes eight hours to complete itself and during that time your team are automated to talk, fight and negotiate with demons while scoring Persona Points and random items that are all given to you at end of battle, along with strengthening your bond with your partner and leveling up your Persona. While the dungeon experience is automated, the real gameplay is in the stat-building required to beat its harder dungeons since this is based on having the right stat numbers. For example, I cleared the first Level 1 dungeon without any issues, but for a while every time I tried to finish the second dungeon, one of my partners told me that my magic stat needed work, meaning I had to either use a Persona with a higher magic stat, use a Skill Card to increase the stat or grind to level up my current Persona until I’d hit the right stat number. Where Persona 5 is a very active dungeon crawling experience with less time spent in the Velvet Room than in the dungeon, Persona O.A. 's use of stats makes it much more prominent portion aside from social aspects and helps to tie in an RPG element into the new search game system. Also in the Velvet Room is O.A.’s gacha system which uses the Persona points gained daily and in dungeons to gain Personas and Skill Cards. Skill cards add skills that increase base stats or effects, with an example being a Skill Card like Baisudi giving a healing and a magic boost which can give the edge needed to beat certain dungeon bosses. What gets me most excited about the Velvet Room though is the fact that there are 193 Personas to collect which means not only are a lot of the ones from Persona 5 are in there, but there are plenty to collect for those who wouldn’t mind an a compendium to fill on-the-go. Along with the Velvet Room mechanics, for those who enjoy the Confidant and social events of Persona 5, there are a bunch of new dialogue events in Persona O.A. to unlock with Persona 5 characters. 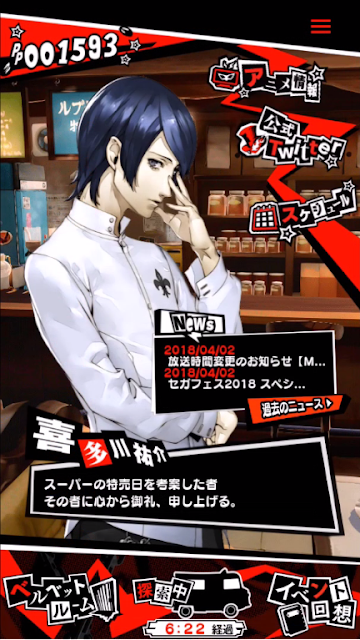 At the moment there are 60 conversation events to unlock with six members of Persona 5’s main cast, with each having 10 respective conversations to unlock like a full Confidant rank would have in the console game. 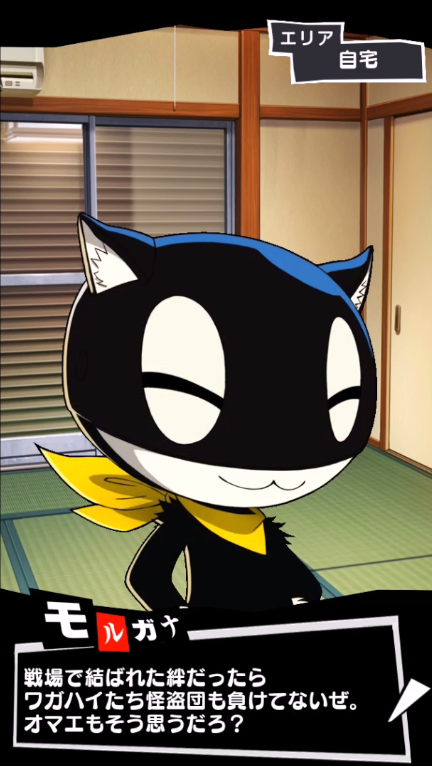 Starting with Morgana, you can unlock conversations by bringing the cast in as Partner’s with you in O.A.’s dungeons, but you can only have one partner with you at a time so unlocking events is a gradual process that gets harder as you go, which I enjoyed as it made it similar to the speed you'd get to know characters in Persona 5. Characters are unlocked by beating the bosses in each dungeon and then their events are found by ranking them up in these dungeons to unlock each of their conversations. So far the conversations have been very true to their Persona 5 roots, with conversations such as Ann’s featuring her talking about training to be a better model and Ryuji trying to get a bike to make people like him being very true to what Persona 5 had made me expect from these characters, so I’m looking forward to unlocking more of the ones with my quirky favourites Futaba and Yusuke hopefully providing more amusing moments with them. As an extra part of raising Confidant ranks, there’s one thing that really made the app feel like a good tribute to Persona 5 in pocket form, and that’s reading books before Morgana presumably makes you go to sleep. After completing a dungeon and any unlocked social events, you can read one of the books you found in the dungeon to raise one of your personal stats such as Guts and Kindness, just like you would in Persona 5. Rather than having one book raising only one stat, you instead can choose the part of the book you want to read into order to raise a particular stat from three choices, with each choice representing a different stat to raise. The choices don’t tell you which choices will raise what, so it’s a little bit of a guessing game based on the choices much like it would be in other Persona games. This guessing game is more than just a tribute to Persona 5 as raising these parameters ties in with Confidant ranks like they do in the console game where certain events can’t be unlocked until a parameter is at a certain rank, so there was a fun challenge of trying to work out what these options would lead to as I picked up more of these in my dungeon attempts. As a smartphone game based around a popular JRPG series with a gacha system and dungeons that can only be finished by waiting eight hours, you’d expect to have its own microtransactions to make money off this app. 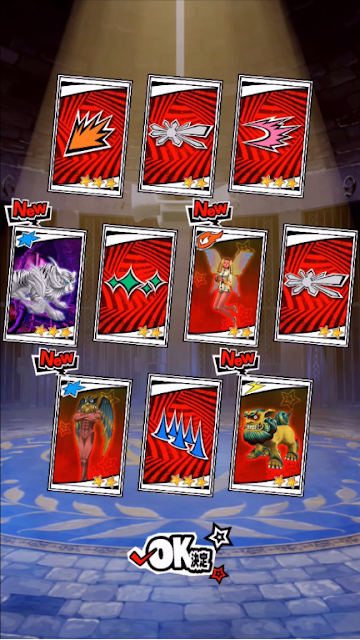 However, it doesn’t and in a nice move, it seems to reward those who buy Persona-related merch with points to use in the game, which is much better than just buying digital coins. By buying special Persona-related physical merchandise with Persona O.A. 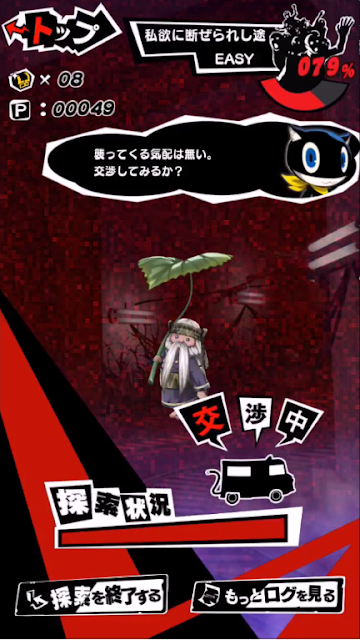 stickers or items on the Persona O.A. merch list, you can gain a lot of Persona points while adding to your video game merch collection, with rewards for things like the Persona 4 soundtrack netting a cool 6,000 Persona points that would get you a whole lot of gacha draws. 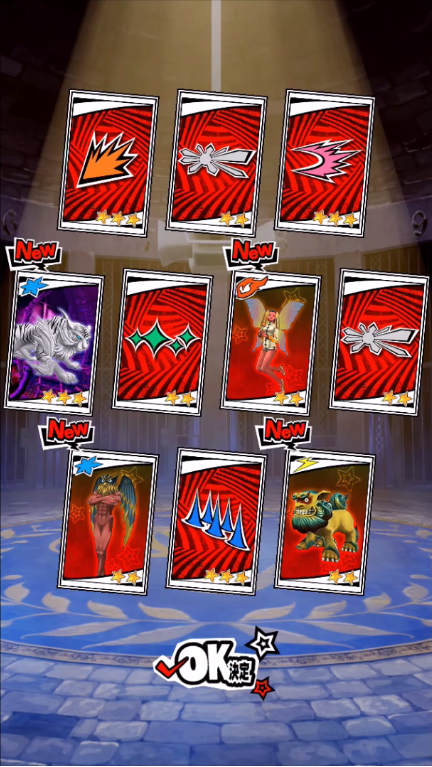 Also, links to Persona products that don’t give points can also be found in dungeons that give you product links you can see in your inventory that take you to where you can buy them are there as a form of fairly noninvasive advertising, so with these two things being how the app is potentially making money, the Persona O.A. experience is basically free. This is my first time seeing this kind of system in a smartphone JRPG and I think it’s a really good idea that I much prefer it to microtransactions since if you do decide to buy some eligible merch for the points, no matter how successful or unsuccessful your gacha roll with the points is, you still have your physical merch at that end of it so in my mind, I wouldn't feel like I was ever losing. And also, since I haven’t used any merch bonuses, it's probably also worth mentioning that I haven’t felt like I’ve needed to yet as between dungeons giving 100 points at the end of them and daily point bonuses, I can still do another gacha draw every day or so. Having no microtransactions to speed things up does add to the passive nature of Persona O.A. though, as that since there is no way to speed up the automated 8-hour dungeon searches, it’s a pretty low maintenance experience unlike the very involved dungeon crawling of Persona 5. Because of its passive nature, it’s safe to say it’s not a Persona 5 replacement, however this is also one of the reasons I liked it. When I’m using my smartphone, I’m usually out and about working or doing what I need to do and I don’t have the time to be doing Persona 5-level dungeon crawling but I can use small moments I have in my day to quickly prepare things in its Velvet Room and have the dungeon crawling do itself and let me get the rewards usually once I’m finished with my day and able to enjoy any conversations events I’ve earned. I was originally hoping for a more engaged system much like the one in Tales of the Rays, but after playing it I can see how it works as a mini version of Persona on smartphones between time away from the full console experience and having them as separate experiences means this app won’t take away from the console game and since I want to keep playing that too, I like that they’re different. I have a feeling Persona O.A.’s passive nature won’t be for everyone, especially those who really enjoy the many deeper smartphone JRPGs available, but I think this app will be good for the console gamer who wouldn’t mind something small to scratch a Persona itch on-the-go before you can get home and play the full game. For those looking for a new Persona experience on-the-go that doesn’t take away from the fantastic console Persona games, Persona O.A. is a good option. 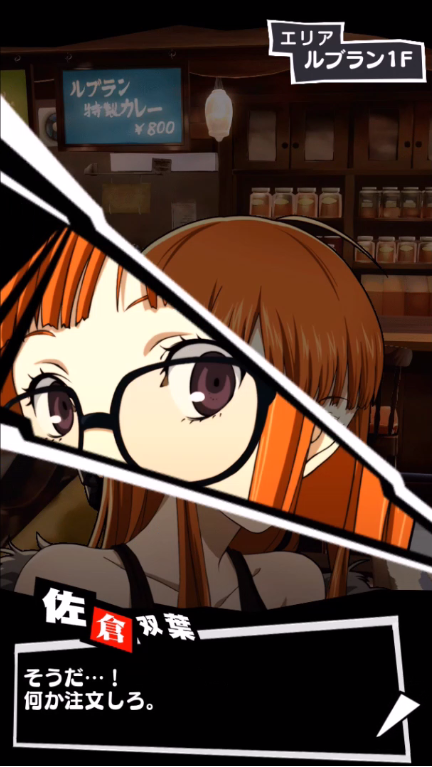 It includes the systems that make Persona great with its monster collection system and stat building for both Personas and your character that make it easy to learn for anyone who’s played Persona, and the extra conversations give extra moments with Persona 5’s loveable cast that I was happy to get more time with. While it hasn’t been localised yet, with its time-respecting gameplay for players low on time, a fair point-earning system and the Persona mechanics I love in a condensed form that works, it’s an enjoyable portable experience. While I would still love to see something bigger and more in-depth like Persona 5 on Switch or Vita to take on train rides and for longer trips, I still hope these new character events and gameplay ideas get put into English sometime so that more people can see them. Please let this get localised! You can try out the Japanese version of Persona O.A. for Android here and iOS here! What do you think of Persona O.A.? Have you tried it?